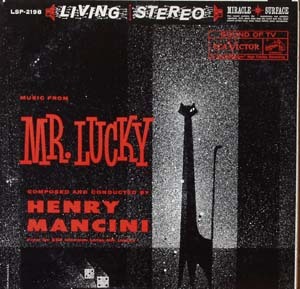 1959 Mancini Music from Mr. Lucky from the CBS television series Mr. Lucky including Mr. Lucky, My friend Andamo, Softly, March of the Cue Balls, Lightly Latin, Tipsy, Floating Pad, One Eyed Cat, Night Flower, Chime Time, Blue Satin & That's it and That's All. RCA Living Stereo LSP-2198. Vinyl and cover both near mint. Satisfaction Guaranteed!